Eoplly New Energy Technology Co., Ltd.
1. It can make use of the natural renewable solar energy to generate electricity, and there are no greenhouse gases and other pollutant discharge during its working process. 2. It has utilized the power grid as the energy storage device instead of storage batteries, which enables it to save 35%-45% construction investment compared with that of the independent solar photovoltaic system. Meanwhile, using no storage batteries can contribute to more mean time between failures as well as the secondary pollution of storage batteries. 3. As the perfect combination of the solar photovoltaic module and buildings, it can not only generate electricity, but also act as construction and decoration material. In this way, it can help to cut the construction costs as well as to increase the technological content. 4. It adopts distributed construction mode, so entering and quitting the power grid are quite flexible. In this way, the capacity resisting wars and disasters of the electrical system is highly enhanced, the load balancing of the electrical system is greatly improved, and the line loss is largely decreased. The solar cell electricity generation system is mainly comprised of the solar cell array and inverter. As what has shown in the following graphic, the electricity generated by the solar cell array can be directly sent to the alternating current power grid or directly supplied to the alternating load power supply by the grid-connected inverter in the daytime. 1. Solar cell module: since an individual solar cell can only generate about 0.5V voltage, it is necessary to connect several solar cells into a module via wires. For instance, if there are 36 solar cells in one module, it can generate 17V voltage. And the solar cell module can be anticorrosion, wind and hail resistant, and rainproof, so it has been widely used in various fields and systems. 2. Direct and alternating current inverter: it can be used to transform the direct current into alternating current. 3. Solar cell array: the solar cell array uses high-efficiency crystalline silicon solar cell panels with the conversion efficiency more than 14%. With small attenuation, it has a long service lifespan more than 25years. The use of aluminum alloy frame with no screw fastening makes the solar cell array easy to install and enjoys high mechanical strength. Sealed by the high transmittance tempered glass, it possesses high transmittance as well as high mechanical strength. And it also employs multifunctional sealing waterproof electrical connectors. The operation voltage of it is 306V, and the open circuit voltage is 396V. The operating current is 35A, and the short circuit current is 37.5A. Its conversion efficiency is more than 14%, and its operation temperature ranges form -40℃ to 90℃. 1. Design of on grid solar photovoltaic system: it is designed on the basis of the original circuits without the need to change the original return circuit. A direct current distribution connector has been fitted in the direct current entry of the inverter in order to ensure the safety and reliability of this system. And the grid-connected grid is designed with the three-phase four-wire output mode. 2. 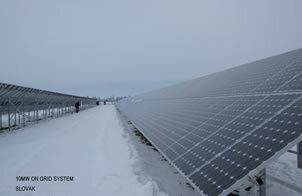 Grid-connected inverter: maximum power tracking technology has been used in this inverter so that it can send the electricity generated by the solar cell panels to the power grid as much as possible. And its display unit can show various parameters for users, such as the voltage and current of the solar cell array, the output voltage, current and the power of the inverter, the accumulative generated electricity, operation conditions, abnormal alarm, and more. Meanwhile, equipped with standard electrical communication interface, it is accessible to remote monitoring. 3. 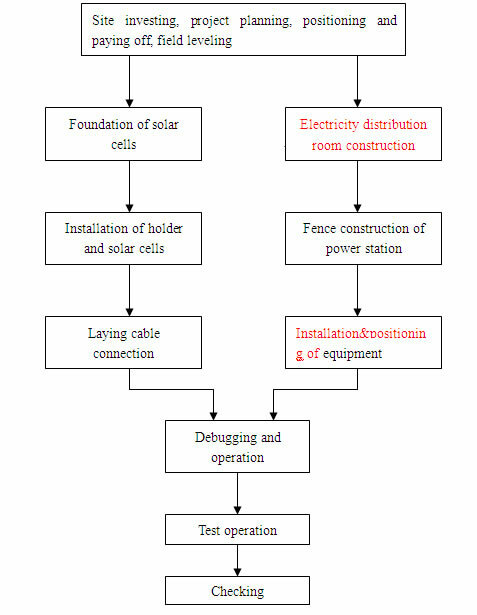 Electricity distributor: because there are no storage batteries, solar energy charging and discharging controller, direct and alternating current distribution system in the on grid solar photovoltaic system, it is necessary to put this power system in a low-voltage electricity distributor room. Otherwise, users should build up a low-voltage distribution room with an area of 4 to 6 m2. 4. Lightning protection: in order to ensure the safe operation of this on grid solar power system in bad whether, some lightning protection measures should be taken. Firstly, as the infrastructure construction of electricity distribution room and solar cell array is underway, users should dig a 2m wire hole in the place where the soil is thick and wet. And the grounding resistance should be less than 4 ohm. Secondly, a lightning conductor, with the height of 15m, should be set up nearby the electricity distribution room, and an independent earth wire is necessary. Thirdly, the entry voltage of the solar cell array into the electricity room is DC220V. Finally, the alternating output line of the grid-connected inverter should adopt first-level protection of the lightning protection box. As a professional supplier of on grid solar power system in China, Eoplly can also provide many other solar products for you, such as monocrystalline and polycrystalline solar cells, monocrystalline and polycrystalline solar modules, solar lighting projects, building integrated photovoltaic systems, off grid solar power systems, portable solar chargers, and solar tracking systems. So far our products have received many certificates like IEC, TUV, CE, UL, MCS of the United Kingdom, ISO9001:2000, KSC of South Korea, and many other relevant authoritative certificates of Europe, America, and Asia. With high performance and competitive price, our products have been exported to North America, Europe, Oceania, Eastern Europe, East Asia, etc. If you ‘re interested in our on grid solar power system, please contact us freely.